I get the impression that The Unholy is a book only you could write, because of the setting, and because of your own background. Let's start with the setting. Tell me about Aztlan. Aztlan is the mythopoeic realm of the mestizos (mixed bloods of southwestern United States). I am mestizo. Aztlan is New Mexico, especially the region of Albuquerque (southern Aztlan) and Santa Fe (northern Aztlan) and extends to the four corners area. Spirits, dreams, visions, and natural magic are woven seamlessly into everyday life. Your protagonist, Claire Sanchez, is a curandera, a term which roughly translates as "Medicine Woman." What exactly is a curandera? What led you to choose this occupation for your heroine? A curandera is a healer. She spoke to me as the story evolved, told me who she was and told me of her struggle to find herself. The path of a healer is fraught with danger. She dramatizes the life of so many women and men seeking to face their fears, find themselves, and walk the path of healing, natural magic, and life. Faith and religion are central themes of The Unholy. You explore the abuse of religion and the conflict that can come from spirituality. What would you say is the central theme or message of Unholy? What impact are you hoping to have on your readers? The central message of The Unholy is Religion Kills. It is made explicit at the end of the tale. News media broadcast Religion Kills as they describe the battle between the evil Archbishop and the young curandera. You live in New Mexico, in the general area where the novel is set. How has this affected the writing of The Unholy? How important was your knowledge of the places and people and culture? What kinds of personal knowledge did you draw on as you crafted your characters and setting? New Mexico is Aztlan. My lineage reaches back for over three-hundred years in Aztlan, a long line of medicine people, healers. I live here, breathe its air, am sheltered under the canopy of its turquoise sky. The Unholy and the natural magic of the medicine women, forces of darkness and light, exist side by side in the daily, mythopoeic realm of Aztlan. I live here. It is my homeland. How has your training and experience as a psychologist impacted your writing in general? For over thirty years I have treated survivors of the dark side of religion. I chose to write a novel about this human drama. Stories cut to the chase. I’ve written three other books in psychology and spirituality, but there is nothing like stirring the imagination via story to set the mind working and the heart healing. I know you've had some specific experiences in your role as a psychologist that led to your decision to write this book. Tell me about that. Religion can be both terrifying and damaging. I help people to heal from the dark side of religion. Decades of such experience led me to write this book and the ones that will follow. Each phantasmagoric story, much like The Unholy, plumbs the dark and light sides of human nature and spiritual experience. 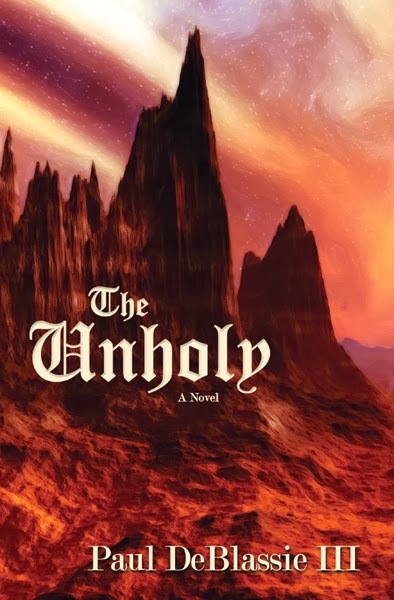 The cover image for The Unholy is striking and haunting, and it's not just some random stock photo. Tell me about that picture. It is the Devil’s Throne, an actual site between Albuquerque and Santa Fe. The evil archbishop performs atrocities there. The land has been contaminated by evil, women desecrated, the air itself befouled. It is the Devil’s Throne in the realm of Azltan! Seconds later, lightning struck a lone tree nearby and a crash of thunder shook the ground. Her body rocked back and forth, trembling with terror. She lost her footing, sandstone crumbling beneath her feet, and then regained it; still, she did not feel safe. There appeared to be reddish eyes watching from behind scrub oaks and mountain pines, scanning her every movement and watching her quick breaths. Then everything became silent. The girl leaned against the trunk of the nearest tree. The night air wrapped its frigid arms tightly around her, and she wondered if she would freeze to death or, even worse, stay there through the night and by morning be nothing but the blood and bones left by hungry animals. Her breaths became quicker and were so shallow that no air seemed to reach her lungs. The dusty earth gave up quick bursts of sand from gusts of northerly winds that blew so fiercely into her nostrils that she coughed but tried to stifle the sounds because she didn’t want to be noticed. The girl turned to follow as her mother’s gaze shifted to an area farther away and so dark that only shadows seemed to abide there. To and fro her mother’s eyes darted before fixing on a black-cloaked figure who emerged from behind a huge boulder surrounded by tall trees whose branches crisscrossed the sky. He was much bigger than her mother, at least by a foot, and his cloak flapped wildly as winds once again ripped through the mountains. Swinging a long, hooked pole, the man bounded toward her mother like a hungry beast toward its prey. His black cloak looked like the wings of a huge bat as they reflected the eerie light of the full moon. As his pole caught the moonlight and a golden glow bounced back onto the figure, the girl saw his face with its cold blue eyes that pierced the nighttime chill. He seemed to grow bigger with each step, and the girl’s heart pounded so loudly that she was sure he would be able to hear it. Quick as a crazed coyote jumps and bites, the man struck her mother, his black cape flapping wildly in the wind. The girl leapt to her feet, her legs trembling, her knees buckling. Straining to see through the branches, she was terrified. The moon vanished behind dark clouds rolling overhead. Then came a scream of terror that cut to the bone. Now the night was lit up again by lightning flashing across the mountain range, and the girl could see the blackhooded man hit her mother again and again. A twig snapped in the forest, and the girl spun toward the sound, holding her breath. Then she saw three gray forms slowly creeping toward her through the darkness and recognized them as wolves. She was not afraid as they encircled her, their warm fur brushing her skin. One after another, the wolves lifted their snouts and looked into her eyes, each silently communicating that she would be protected. Her mother cried out again. The girl turned and saw her rising to her feet, then striking the man’s chest with her staff. As he batted his pole against her shoulders, her staff flew out of her hands, landing yards away in a thicket of scrub oak. Her mother screamed and blindly groped for it. As she peered through the trees to catch sight of her mother, a wailing wind blew the man’s cloak into the air, making him again look like a monstrous bat. Once more he swung his rod high and smashed it against the back of her mother’s head. She saw and heard her mother’s body thump against the hollowed trunk of the lightning-struck tree and slump to the ground. The evil man bent over her mother’s limp body and howled. Suddenly, the girl felt arms encircle her waist, and she was swept away, deeper into the forest. She sobbed and at first let herself be taken because she had no strength. But then she became angry and started pushing against the arms carrying her, trying to escape and run back to her mother. She wanted to make her mother well, and then this nightmare would stop and they could go away. Heaven and Hell make me think of Good vs. Evil. God vs. the Devil. Thanks for having the giveaway. Every fairytale-like story I've ever read is about good vs evil. It's what creates a story. I just love how pretty your posts always are :) Thank you for hosting Paul.